The subtitle of The Gourmet Atlas, by Susie Ward, is “The History, Origin, and Migration of Foods of the World.” I don’t think I could come up with a better description, though calling the book “atlas” almost falls short. It’s more-or-less an encyclopedia of category of food you can think of, from oils and vinegars, to vegetables, seafood, nuts, tea, and more. The text is mainly devoted to the history and cultural influences of various foods. You can read about the ways foods or dishes got their names, or how they were processed originally, and how those processes have evolved over time. Sidebars provide additional trivia, describing implements for eating seafood, discussing various religious food restrictions, or the curative properties of onions, for instance. 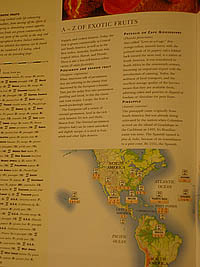 Despite all of this additional historic and cultural information, the book truly is an atlas. Its main feature consists of several lists. These lists describe each variety of all the different ingredients covered in the book. They also serve as keys to the many maps found throughout each chapter, showing where each variety originated and/or are produced today. Additional maps show ancient trade routes and how different ingredients have migrated around the world. The first farming settlements are mapped, as well as American cattle trails. What kind of bread is baked where? There’s a map for that. Regional Italian pasta dishes, too. That said, The Gourmet Atlas can’t be called a cookbook. The recipes are so few, they almost seem like an afterthought. However, those that are provided are clearly focused on the subject of each chapter, as simple examples of the foods being discussed. You’ll find “French Spiced-and-Soused Sweet Clementines” under citrus and “Shrimp and Scallop Soup” under shellfish. The dish I chose to try I found among the grains, the polenta representing corn. As per usual, I didn’t follow the recipe exactly. It tells you to cook the sausage no less than three times, first frying it, then boiling it alone, then slicing it and simmering it in the sauce. I took a tip from Nigella Lawson in 641 HOL 2006 – Holiday Cooking with America’s Top Chefs, and just baked the links in the oven, before slicing and adding to the sauce. I also chose to slice my onion instead of chopping, and I used half the tomatoes called for. I think, a lot of times, tomatoes tend to dominate the other flavors in a dish. 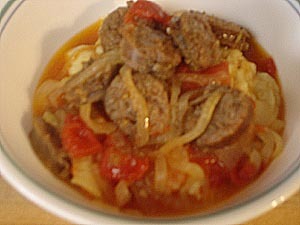 I wanted the sausage and the onions to be more of a main component of this dish and the tomatoes to complement. And is it just my own inability to do math, or is there something funny about the cup-to-oz equivalents in the recipe? I don’t know. I just used cups. Oh well. Anyway, this was delicious. In a large, heavy saucepan bring 3 3/4 cups (1 1/2 pints/750 ml) water and salt to a boil. Add the cornmeal in a thin stream, whisking constantly. Cook the polenta over medium heat, stirring continuously, for about 40 minutes, or until the mixture pulls away from the side of the pan. (This can also be made using instant polenta, following directions.) Cover and keep warm. Heat the olive oil in a heavy skillet. Add the sausage and brown; remove and reserve. Saute the onion until golden and translucent, about 10 minutes. Add the garlic and cook for 1 minute; remove the onion mixture and reserve. Return the sausage to the pan. Stir in 1/2 cup (4 fl oz/125 ml) water, cover, and simmer 10 to 15 minutes until the sausage is cooked through and the water has evaporated. Remove the sausage and discard any fat in the pan. 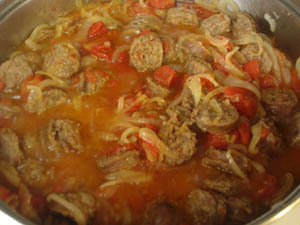 Slice the sausage and return to the pan, with the onion mixture and tomatoes, breaking up the latter with a wooden spoon. Cover the pan and simmer 30 minutes. Just before serving, stir the cheese into the warm polenta. Stir the parsley in the meat sauce. Serve each portion of the cheese polenta accompanied by the tomato-sausage sauce. 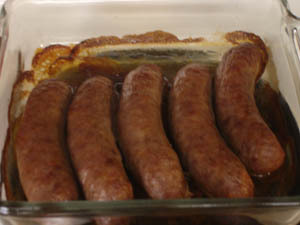 Ward, Susie “Polenta with Italian Sausage” Recipe. The Gourmet Atlas. New York, NY: Quarto, 1997. 46.